Contact lenses have transformed the way that people see over the last few decades, with the wealth of products currently on the market testament to how people across the planet have benefitted, and continue to benefit, from excellent vision. However, despite all contact lenses being packaged with instructions showing people how to use them and explaining the do"s and don"ts of contact lens wear, it is evident that many people are failing to heed these guidelines. Recent research published in an issue of Optometry and Vision Science, the official journal of the American Academy of Optometry, which showed that 85 per cent of people who wear contact lenses think that they are following standard guidelines for both usage and care, but only two per cent actually do so. A study carried out on behalf of Bausch + Lomb"s Biotrue multi-purpose contact lens solution and seen by Easier.com, 90 per cent of contact lens wearers in the UK are do not have perfect contact lens care routines. Many are committing the optical faux pas of wearing them for longer than recommended, with some often leaving them in throughout the night, despite manufacturer recommendations to the contrary. The research revealed that almost half of contact lens wearers regularly leave their contacts in for several hours longer than the time recommended by eyecare experts, while one in five respondents admitted to leaving the products in for 24 hours longer than advised. The study was carried out to look at how different factors influenced people"s contact lens wear, such as their profession and travel habits. Of the 2,000 adults surveyed for Bausch + Lomb"s new study, 20 different professions were identified, with the data revealing that people working in human resources were the most likely to wear their lenses for longer than they should, with almost a fifth of these workers having worn the same contact lenses for 49 hours over the recommended time. The workers least likely to wear their lenses for too long are those in travel, leisure and tourism, with almost a third always wearing them within the recommended timeframe. Another factor examined in the study was whether age can have an impact on wear time, though every demographic seemed more or less equally guilty of this. The age group marginally less likely to adhere to the time prescribed is those aged 55 years and older, with almost 95 per cent admitting to wearing their lenses for too long, with 90 per cent of 44-55-year-olds admitting to breaking the guidelines, even though the latter was the best demographic for sticking to the rules. Commenting on the data, Brian Tompkins, from Tompkins Knight and Son Optometrists, told Easier.com that wearing contact lenses for longer than the time recommended is obviously not something optometrists or contact lens opticians encourage their patients to do, but realistically it is something that all wearers will probably experience at least once. 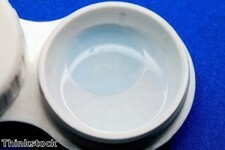 Interestingly, some 47 per cent of study respondents said they would be interested in a product that would make contact lenses more comfortable to wear for longer, but Mr Tompkins said people can help to get the most out of their lenses by using a modern multi-purpose contact lens solution that can provide long-lasting moisture. Nonetheless, it is still important that people only wear their contacts for the recommended period of time, with people who follow this rule likely to find their lenses are comfortable and they suffer fewer eye problems.